4-Word Review: This homecoming isn’t happy. Tim (Martin Sheen) arrives home from the war to find that things aren’t going well with his parents John and Nettie (Jack Albertson, Patricia Neal). 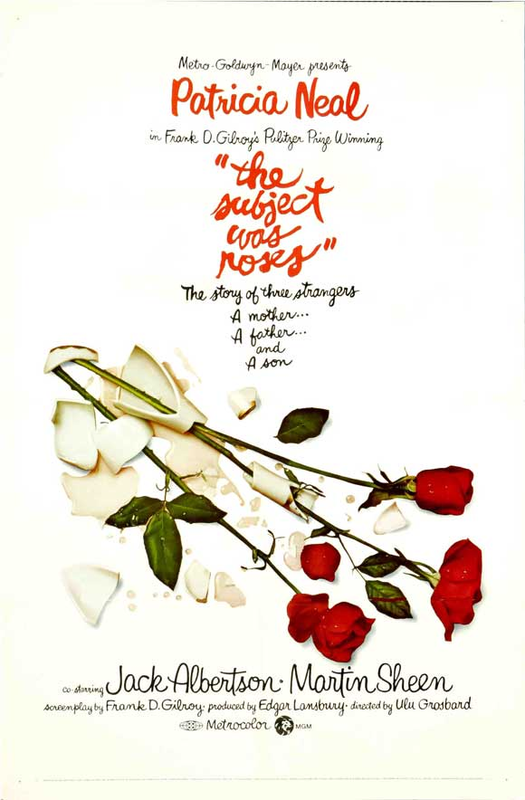 Their aloofness towards each other slowly becomes more apparent and seems to come to a head when Tim decides to buy his mother a bouquet of roses and his dad pretends it was his idea. When Nettie realizes it wasn’t John who bought them she leaves the house and doesn’t return, which causes John to panic and try to find her. This movie has a compelling quality to it and is the old-fashioned type of drama that they don’t seem to make anymore. The characters are real and believable and will probably remind one of their own parents, or even themselves and their marriages. The dialogue has a great conversational style and the viewer feels like they are eavesdropping onto an actual household. The action happens slowly, but deliberately and is devoid of any neat and tidy wrap-ups. However, the film is also a bit frustrating. We are never explicitly shown what it is that is troubling Nettie so terribly. We are given some definite hints of things bubbling just underneath the surface, but there is nothing that completely comes out into the open. The viewer becomes primed for some great revelation, but when it doesn’t come and the characters end up remaining in the same situation as when it began it makes the whole thing seem pointless. Neal is outstanding and the main catalyst for why this works. This was her first film after she had suffered several near fatal strokes in 1965. Although she does very well one can still see some subtle effects of it like the way she walks and her speech being just a little bit slower, but in context with the role it makes her seem older than she really is and therefore better for her role. I was surprised at how physically demanding the part was including having her dance rigorously around the living room with Sheen as well as having to aggressively fight off Albertson’s unwanted advances. Her sad and pained facial expressions leave the most lasting impressions. The story takes place in the 1940’s and is basically a loose autobiographical story of Frank D. Gilroy who wrote both the award winning play and screen version. For the most part it succeeds with its retro look, but the music by Judy Collins doesn’t fit. Personally, I love Collins as a vocalist, but her raw, moody folk music sound seems out of place for a 40’s setting and takes the viewer out of the story in the process. Transferring a story done for the stage to the big screen is never easy, but director Ulu Grosbard manages to make it cinematic. None of it was done on a soundstage, but instead the apartment was built inside a warehouse in the same Bronx neighborhood where Gilroy grew up and painstaking detail was done to give it an authentic lived-in look. The scenes done at their lakeside cabin is also effective as it captures the blossoming spring time landscape and gives a nice soothing feeling. You also get to witness Sheen skipping stones across the lake several times something that I could never get the hang of myself.